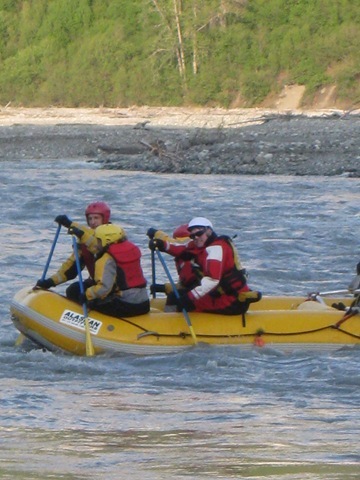 Take a ride on the wild side, rafting on the Matanuska River with Madwater Rafting Company. 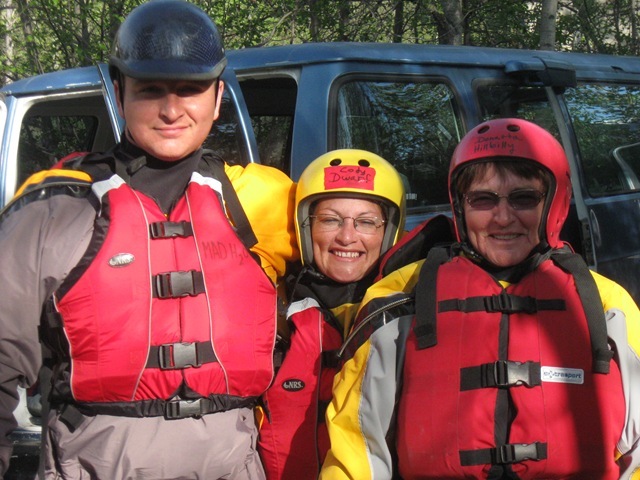 First get suited up in dry suits and instruction on the river before heading down the rapids. You start on the Chickaloon River before heading down to the Matanuska River for your 4 hour journey. 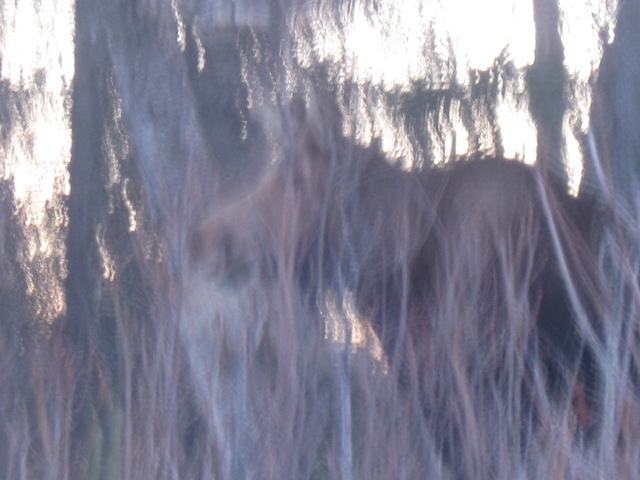 View wildlife moose, bald eagles, majestic mountains along one of the most exhilarating rides on the river. Sutton to the Majestic Lodge, along the mighty Matanuska River, 54 miles of the most beautiful part of the Glenn Highway. 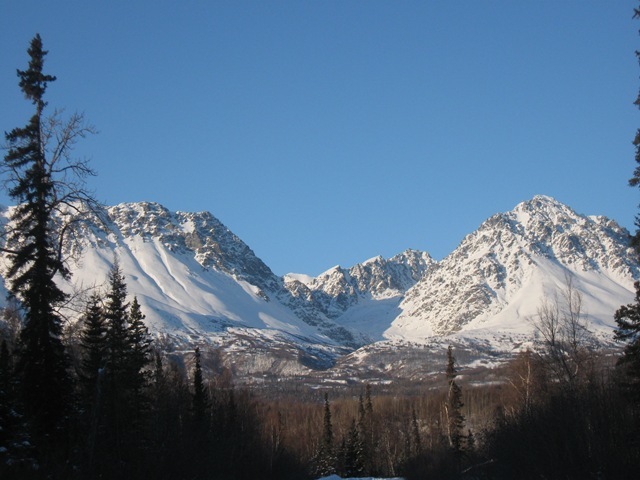 Nestled between the Chugach and Talkeenta Mountain Ranges, Visit the Historic Alpine Park. Athabascan Culture Exhibits, native music, dancing and storytelling. Madwater River Rafting. Stop at Pinnacle Mt RV Park & Café’s petting zoo with over 100 animals. Gifts Stores, Antiques Shops, Native Art, gold panning, hiking, Geo-Caching Maps at the Sutton Visitors Center. The Matanuska Glacier, the only glacier accessible by car, Walk on A Glacier. 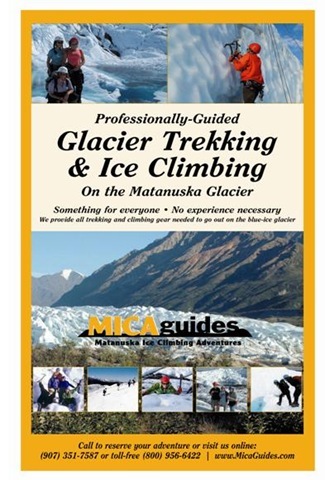 Glacier Trekking & Ice climbing with Mica Guides, View wildlife, Dall sheep. Comfortable lodging, at Tundra Rose Guest Cottages, Grand View Café & RV Park , Sheep Mt. Lodge, Majestic Valley Wilderness Lodge & Matanuska Lodge,…So Much To Do ! 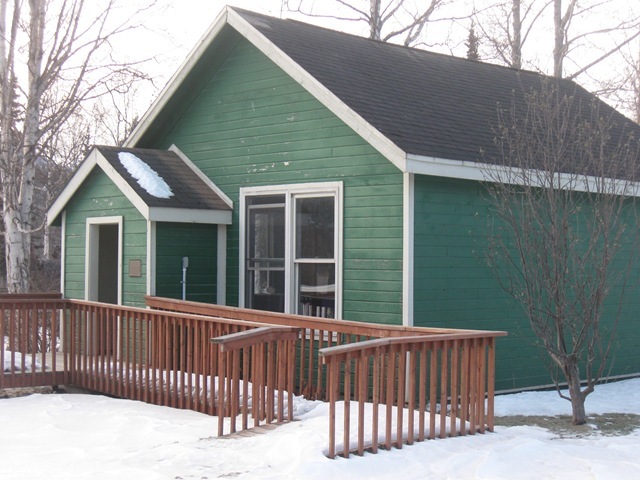 The Matanuska Lodge: Mile 99.5 Four beautifully decorated rooms w/private baths, a 7 person deck located hot tub, a game room w/pool table & exercise equip. Splendid views of on site private 40 acre lake with paddle boats and canoes, w/ The Matanuska Glacier at your doorstep. Daily Breakfast & Hors d’oeuvres w/special Continental fare, Dinner by request. Big screen TV, Wireless Internet. Private bath robes, hairdryers, and lighted makeup mirrors. Radiant heat floors & ceiling fans, total blackout shades. Wildlife that visits & a spotting scope for viewing Dahl sheep from a picnic area & fire pit. Near Mica Glacier Guides & Nova rafters. 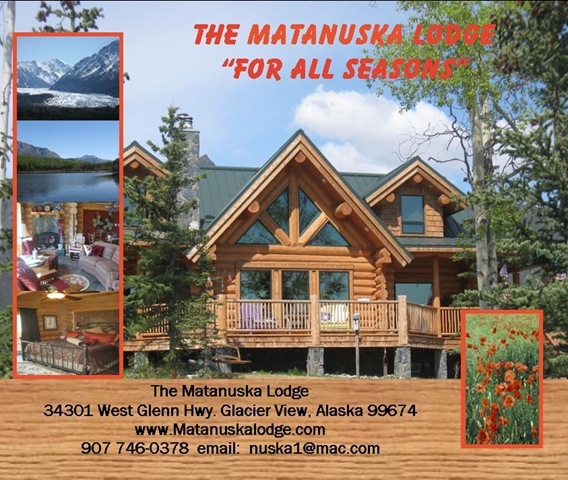 The Matanuska Lodge, a resort for all seasons, w/activities to enjoy any time of year. For The Discriminating Traveler. MP 109.5 Three quality guest cottages in a relaxing nature setting with unobstructed Matanuska glacier views, kitchenettes, coffee makers, gas fireplaces, private baths, private decks/ patios and cable TV. Located at the base of sheep mountain, Dahl sheep can be viewed on the surrounding mountains. Dining and Laundry services nearby. 907 745 5865 If calling long distance from within Alaska, call 1-800-315 5865 for reservation. MP 109.7 Is your dining and RV camping destination while entering or exiting Alaska. Relax in our log café, which features hearty home style meals and brick oven baked pizza. Full service pull-through RV sites have 30/50 amp electric with delicious spring water. The only RV park with commercial cable TV and WI-FI at every site! Spectacular panoramic mountain views, Dahl sheep and other wildlife viewing. 15 Minutes to the Matanuska glacier by car. Sheep Mountain Lodge: Mile 113.5 11 Comfortable cabins w/private bath. Full service restaurant, hot tub & sauna. "Premium guest cabins with kitchens." Breathtaking views of the Matanuska River Valley. Diverse recreational trails for hiking & cross country skiing. Wildlife Viewing, easy access for RV’s & Buses. A Serene Wilderness amidst Alaska’s Chugach & Talkeenta Mountains. Comfortable Rooms and Cabins. Summer & Winter Activities. Convenient location to Denali & Wrangell St. Elias National Parks. Wildlife Viewing. Perfect for weddings, retreats & special events. All rights reserved @Web Press Designs. No photos or ad’s can be reproduced without written permission from webpressdesigns@msn.com . This station broadcasts from Anchorage, great listening. A mix of music, news, events and discussions. Click on links to find out more about what is happening on this site. today the topic was the word LOVE. We are all tribes of the world. Listen and Learn Something New ! Streaming is made possible with support from listeners like you. Please make a contribution now. Thanks for your support. Coming To Sutton Summer 2009 – Watch for details! Geocaching is a relatively new sport that has become popular with the advent of easy-to-use Global Positioning Satellite receivers (GPSr). Players create and hide containers (known as caches) with a logbook, and depending on the container, items for trade. Their coordinates are recorded with a GPS, and the cache is posted on a website, along with a description and other useful information. The seekers load these coordinates into their GPS, and head out to find the cache. The Glenn Highway Scenic Byway. Stop by to pick-up maps and coordinates! There are over 1000 geocaches in Alaska, in every part of the state. Many are located in relatively populated areas, in municipal parks or other easily accessible locations. Others are located along the highway system in Alaska, and guests could literally find dozens of geocaches every day as they travel through the state. A few are located in very challenging areas, and require considerable physical skill and specialized equipment, such as climbing gear or a boat to find. Alaskan geocachers do a very good job of placing caches in particularly interesting locations, so that their fellow players can discover and enjoy some of Alaska’s more spectacular sights and experiences while searching for geocaches. Alaska’s scenery is spectacular almost everywhere you go. A visitor might plan a trip to Alaska with the goal of geocaching every day, or perhaps plan a vacation in Alaska and travel around, and visit geocaches that he or she comes across along the way. For example, there are literally dozens of geocaches on the road between Anchorage, Denali National Park and Fairbanks. In either case, the geocaching guest can expect spectacular scenery and some very creative geocaches. A winter view of Mt. Eska taken near a geocache along the Glenn Highway near Sutton, Alaska. Of course, a geocacher will always have his or her GPS receiver with them. Fortunately, Alaska is very well connected to the Internet, so if a guest had a laptop computer, one could easily connect to the geocaching.com website to download coordinates of caches. Since geocaching is an outdoor sport, all of the usual gear that you would need for a walk in the woods is appropriate, such as insect repellent, rain gear, appropriate footwear, etc. Also, since Alaska has a large number of large wild animals that wander the woods, a knowledge of safe outdoor travel and what to do when confronted with a large animal is also very useful. We are very familiar with the sport (this is one of our personal hobbies), and we would he happy to assist you with planning an Alaskan vacation that would include geocaching, either as a casual diversion while here, or as a geocaching safari. 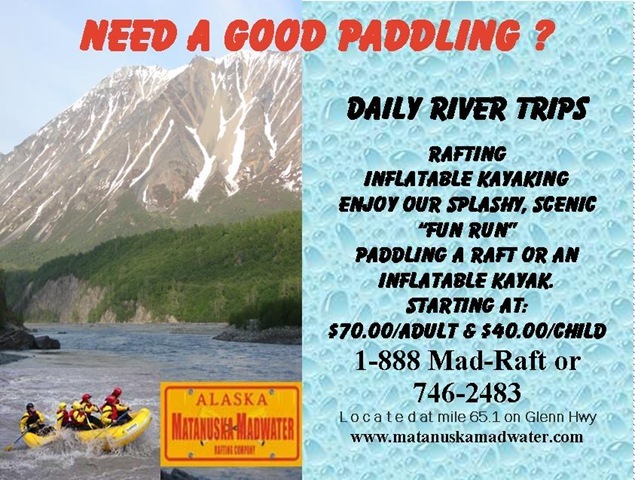 The Matanuska River has two Rafting Companies, Nova Alaska and Madwater Rafting, with offices located in Sutton and Chickaloon on The Glenn Highway. 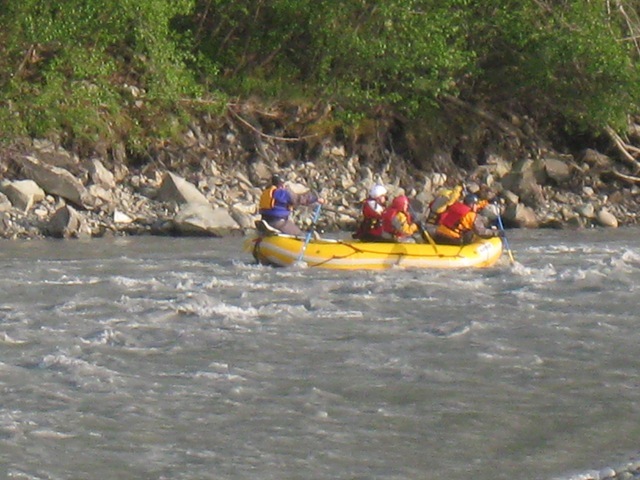 Matanuska-Susitna County, Lions Head section whitewater kayaking, rafting, and paddling information. This section of Matanuska River in Alaska is 5.2 miles long and is according to American Whitewater a class III+ section of whitewater. The scenic beauty of Alaska and the water flowing gracefully down Matanuska River beats anything. Getting your paddling muscles activated and spending some quality time in nature are great reasons to come. For all you camping people there are campgrounds nearby. You might have to settle for a hotel a bit away from the river if you want to stay the night, but do book a room before you come because it is a very popular destination. 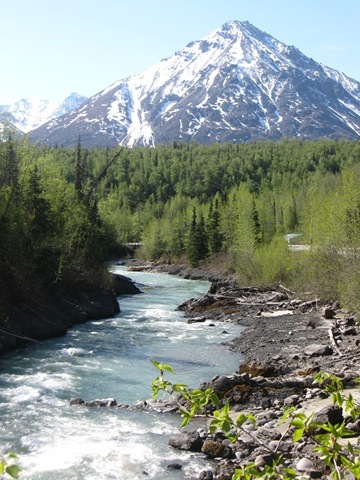 When you’re paddling down a Talkeetna Mountains river like this one you always get great scenery along the way too. 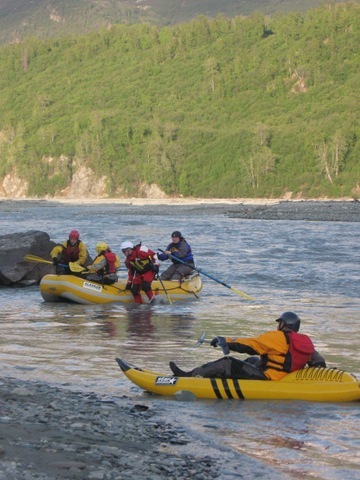 The average Alaska whitewater rafting or kayaking river tends to be a bit harder to master than those in other states, so if you’re visiting here do keep in mind that many of the rivers here are not very forgiving. You might be into whitewater rafting or kayaking or both, doesn’t matter, around here you won’t find a large number of other rivers. This river system has a few good paddling stretches and the Lions Head section is one of them. This stretch has has enough mileage, suitable for an afternoon trip. During the summer, highs regularly are in the 60’s at Matanuska River. Once the sun is down it plunges down to the 40’s. Throughout the winter the highs are regularly in the 10’s, and winter nights come with lows in the-10’s to Matanuska River. Matanuska River is pretty dry regularly; most of the rain falls during July while April is the month with the least amount of precipitation. 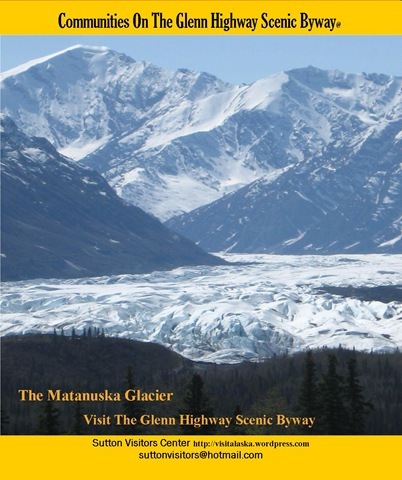 No need to travel far to stop by interesting stuff like Matanuska Glacier. 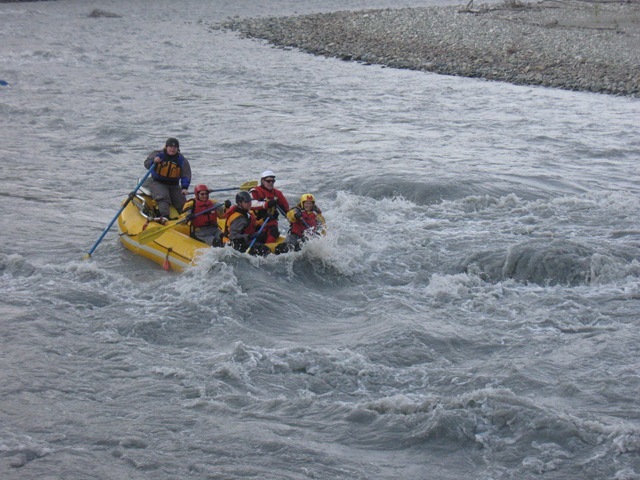 WICKED FUN RUN- Launching from the pristine waters of the Chickaloon River, you will enter the mighty Matanuska River for an afternoon of awesome Class II / Class III whitewater rafting. Minimum age 5 yrs old. 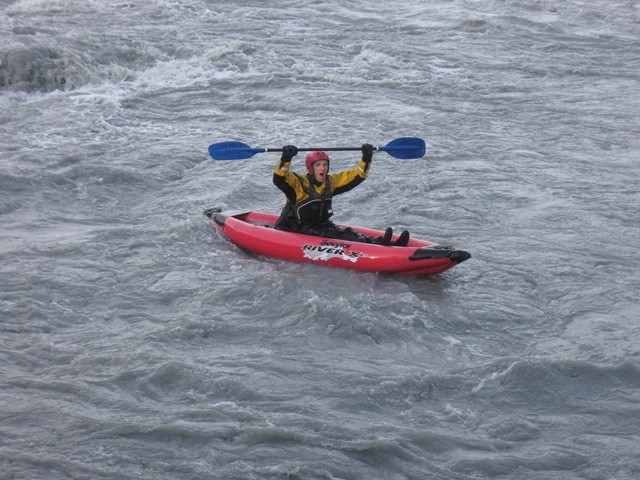 LIONS HEAD- This section of the Matanuska River is a splashy Alaskan favorite suitable for all levels. Whether you are in an oar assisted paddle raft or are doing all the paddling under the instruction of a professional river guide, you will have a wet and wild ride. Minimum age 12 yrs. old. 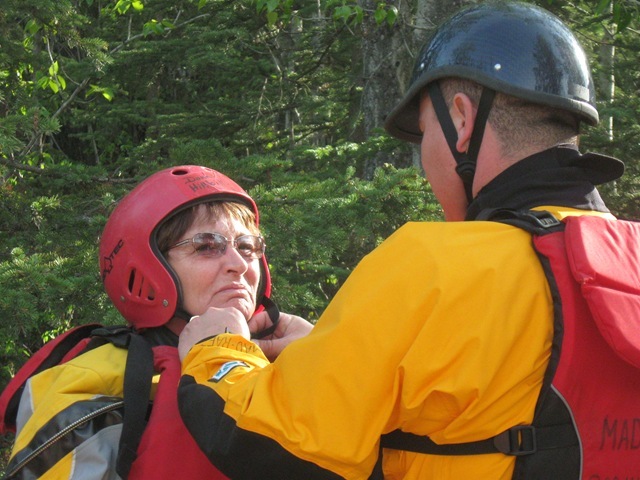 Experienced river guides, quality professional dry suits, rubber boots, and USCG-approved life jacket. 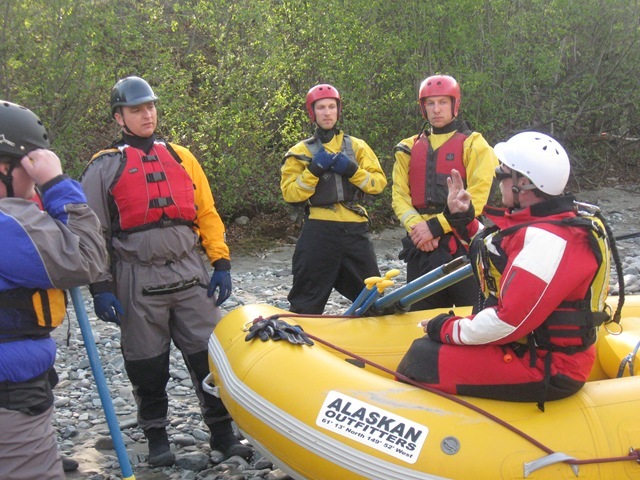 NOVA is an Alaskan river touring company that has been providing Alaska scenic and whitewater river rafting day trips near Anchorage and wilderness river rafting trips since 1975, glacier hiking tours on the Matanuska Glacier and river rescue training since 1980. 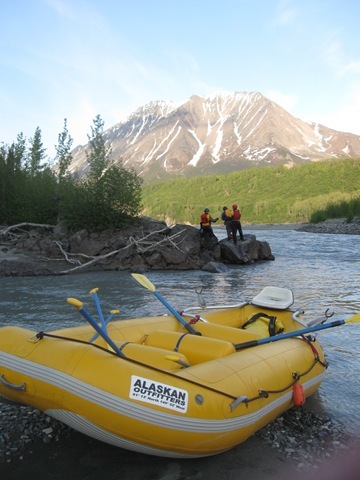 Additionally, we are the Alaska dealer for Vanguard Inflatables and their fine line of whitewater rafts and kayaks. Our exciting selection of day river rafting trips are based on their special locations and features and not where the ‘captured audiences’ are. These trips have continued to be popular with locals and their visiting friends and relatives since 1975, and our ability and experience to handle small to large groups and their special needs offers an experience everyone will remember. 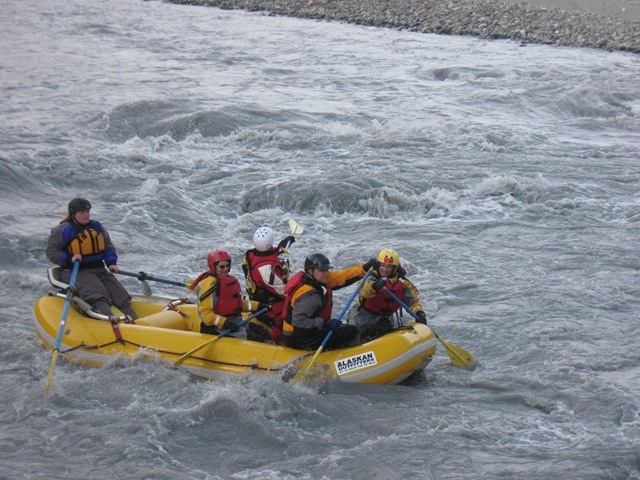 Whether you are focused on thrilling whitewater or a more mellow experience for yourself, friends, family, wedding parties, company parties and team building experiences, NOVA has a trip to suit any interest from class I to V.
We have developed a series of multi-day, wilderness river rafting trips that will get you into some of the most remote country in Alaska. Or wilderness trips are especially good for spotting wildlife and experiencing Alaska away from the busy tourist areas. 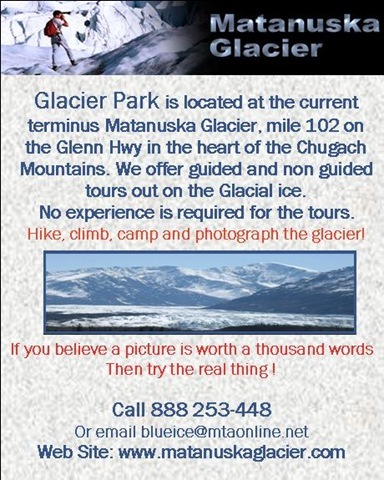 Joins us on the Matanuska Glacier for a day hike that you will never forget. An experienced and professional guide will take you out on the ice to explore the otherworldly landscape of glaciers and inform you of its’ natural wonders.